On Friday the 1st of June 2018, a seminar on 'Diversity & Inclusion Management' was held at TUFS. This seminar was aimed at the executives, department chiefs, section chiefs and assistant section chiefs of TUFS (a total of 25 people attended). 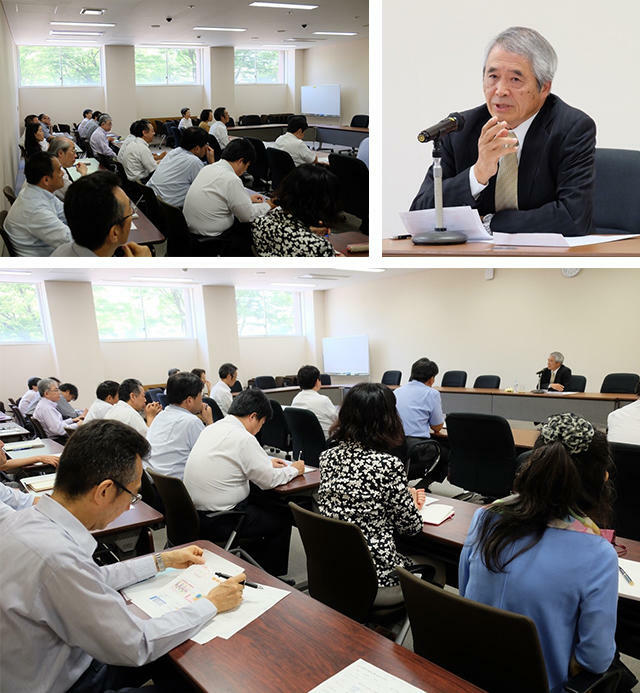 The seminar was taught by TUFS Alumnus Mr. Keizo Morikawa, Chairman and Representative Director of Cosmo Energy Holdings. Mr. Morikawa covered discussed the necessity of changing and adapting business environments to implement diversity, with a particular focus on the challenge of implementing higher productivity and shorter working hours for the advancement of women in the workplace, and what kind of supporting policies have been put into place to realize this in a top-down manner. *This seminar was held as part of the Ministry of Education, Culture, Sports, Science and Technology's 2016 'Initiative for Realizing Diversity in the Research Environment, Funds for the Development of Human Resources in Science and Technology'.